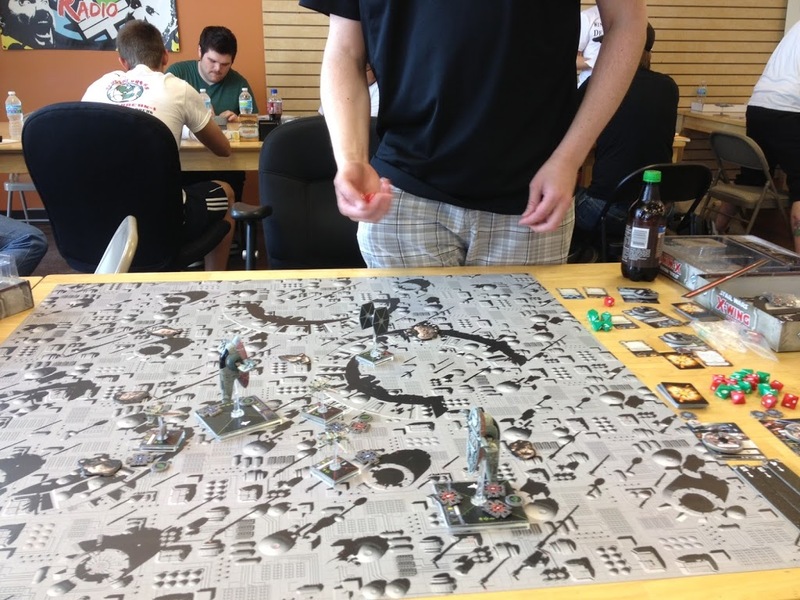 As with any miniatures game, a community of involved and active players can help to foster a great environment for playing X-Wing which ideally will attract new players and help retain the veterans. What are some of the hurdles in the way and how can you overcome them? Read on! Having a tight-knight and supportive community to play any miniatures game in, including X-Wing Miniatures, can really be a good time. Maybe your local X-Wing community is already there- recruiting players by putting on regularly scheduled demos, hosting all kinds of interesting events, running an ongoing campaign, and having regular league nights. Maybe y’all have even talked your FLGS into closing up early a night or two a week to blast some John Williams over the shop stereo while y’all roll the red and green bones. Or maybe not. Hopefully that’s where I we (hey, I don’t have all the answers here) come in and remedy that. Because that’s more or less where I’m at with it in my neck of the woods too- a relatively low key scene without a lot of coherence. I tried to kind of organize things around here back before my wife and I had our second kid, but the efforts were largely unsuccessful and I decided instead to put my efforts into what would end up becoming TheMetalBikini.com instead of my local scene. Now, I realize that may sound kind of strange- writing an article about growing your X-Wing Community when I failed at growing my own, but that was almost two years ago and I hope I’ve realized where I went wrong a couple of different places that y’all can learn from. Yup, that’s me in the Misfits shirt. 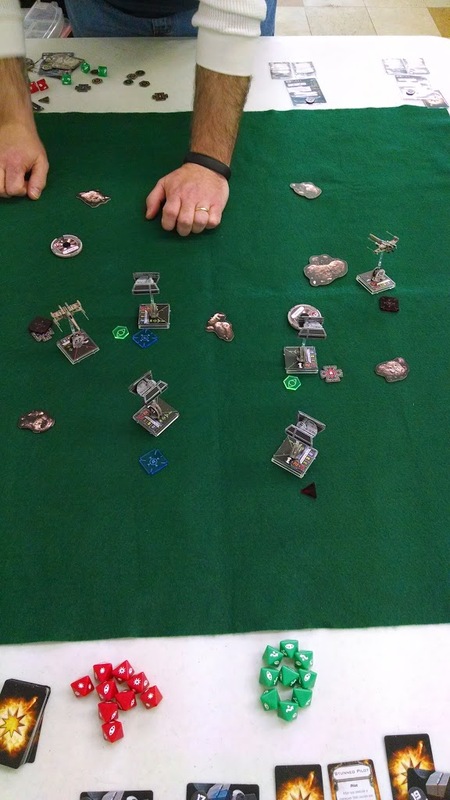 No, we’re not playing X-Wing, but it is at my FLGS at least. See, the thing about X-Wing is that you don’t really need to play it in a store. This is a good thing and a bad thing, of course but in this context, it’s kind of a bad thing because a lot of us that play miniatures games use the store as more than just a store- we use it as a meeting place, a gaming location, and a social setting. Trying to get something going for a game that doesn’t really require you to be in that common, comfortable space can be pretty difficult when we’ve become so reliant on it to provide us basically everything we need for our gaming fix. 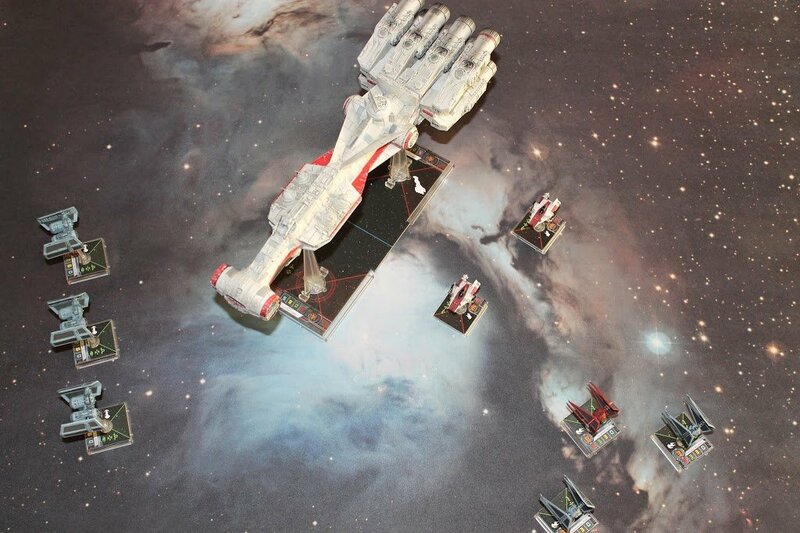 Most miniatures games take a little more… well, stuff to play than X-Wing. I mean, sure, you could play 40k or Warmachine or Malifaux or whatever at your house, but you need a pretty good-sized gaming table (or relatively clean kitchen floor), scenery, and maybe most importantly, about 3-6 hours of time that you aren’t being disturbed or disturbing the other people at your house, not to mention some place to store all of that stuff when it isn’t out nerding up your table. If you’re 20-something, you’re probably thinking, “Yeah- and?”, but for those of us who are old and have families and stuff, that can be pretty difficult. Or conversely, if you’re still living with your folks and they’re not crazy about having a bunch of strangers (especially random 40-year-old strangers) over to play a game, that can be problematic too. Hence, we all just decide to meet up at the store. 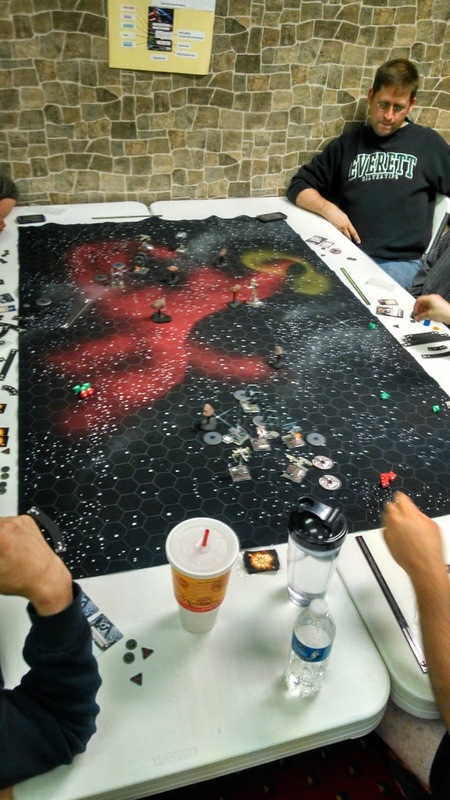 All but the largest X-Wing matches can be played generally in 60-90 minutes, require only a 3′ by 3′ square surface, and there’s no real scenery to speak of save a space mat on which to play. Storing all of that stuff probably takes up about the same amount of space as the typical Guard army and associated books. If that. Me again. Rockin’ a Red Army T-shirt at the Kessel Run. If I were trying to put my finger on it, I think this is the main reason that X-Wing seems to be played more outside of stores than in them- that gaming space outlay just isn’t there like it is for most miniatures games. 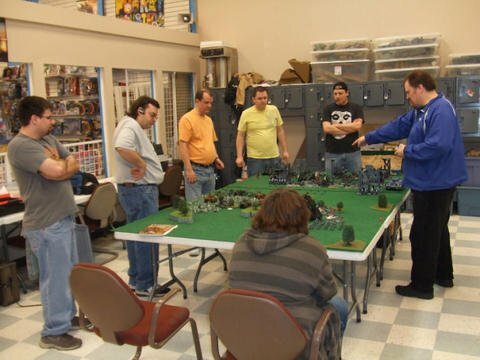 I have nothing but my own opinion to back that up, but I think that’s a big reason why people play at their stores- the space and the logistics of space, that is having dedicated space for your miniatures gaming obsession hobby and all the associated accouterments. There’s also all that prep work of trimming, assembling, and painting (again- more space that has to be taken up) that can be a fairly social experience if you’ve got a common and inviting place to do it in. Obviously X-Wing has none of that either. 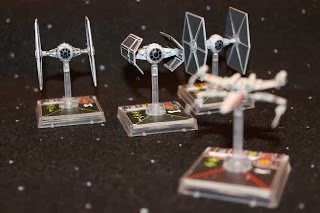 Lastly, being as how X-Wing’s ruleset is relatively straightforward and easy to learn, most folks don’t really need to be taught how to play it the way they do some of the more complicated miniatures games. I was 30 when I got into 40k and not knowing anybody who was into miniatures game, let alone having played any other miniatures games myself, I read the 4th ed rules a couple of times and felt like I basically had no idea how to play. Luckily, I found a group and they showed me how to play; filling in the blanks and correcting me where I’d misinterpreted things. After a few sessions, I had the hang of the rules and at that point, I could play games out of my own place. Before that though, it would have been a challenge. And by challenge I mean pretty frustrating and very likely not 40k as it was intended. X-Wing though, you don’t have that so much. Sure, you might get online to look at the FAQ or read up on the way a couple of rules interfere with each other, but for the most part, a couple of reads through the rulebook and you’ve got the basics down cold. So with all that working against you, how in the world could you ever attempt to get a scene going? My buddy Sean, from the neck down at Regionals 2013. While it’s probably easiest and most obvious to get a gaming group from the customers at your FLGS and if possible, use some of their gaming space, take some of those things I mentioned that can make X-Wing tough to organize, turn them around, and you just might be able to use them to your advantage. Again- you don’t need a ton of space to store your stuff, and it’s pretty easy to come up with a fairly mobile X-Wing kit, so take it wherever you’ve got some interested folks. I’ve gotten letters from my readers saying they’ve organized lunch-hour matches where they work, and yeah- I’ve even done it myself a few times. I got an email recently from a guy who organized an X-Wing community at his church with some of the high school kids he mentors. That’s perfect, huh? After school, before school, in-between your college classes, at the corner bar after work, once you realize that you don’t have to be in a store to play, you might be surprised where you can strike up a game. I mean, it’s Star Wars after all- lots of people like Star Wars, right? Lots of us had Star Wars toys as kids and secretly, or not so secretly, wish we could still play with them in a somewhat socially acceptable way. And as you know, and as I said before, the rules are pretty easy to pick up. Ask around- throw it out at work that you play this game and maybe somebody will ask you more about it. Next thing you know, maybe you’ve got a few guys wiling to stay over a little bit after their shift to play in the storeroom or cafeteria or breakroom. It doesn’t have to be at your game store within their hours of operation and schedule for Yu-Gi-Oh! getting in the way or whatever. Hells bells, push a couple of tables together at a Denny’s after your and your buddies wrap up a night of being out on the prowl on a Saturday night. My buddies and I used to play the old West End Games Star Wars RPG in the back of our local McDonald’s fer Chrissakes. And remember- the first rule of X-Wing club is you do not talk about X-Wing club. Er no- actually talk about it lots. If you’re attached to the idea of playing in a store, or you’ve already got a solid club but you’re looking to grow your membership, give people a reason to come play at the store. 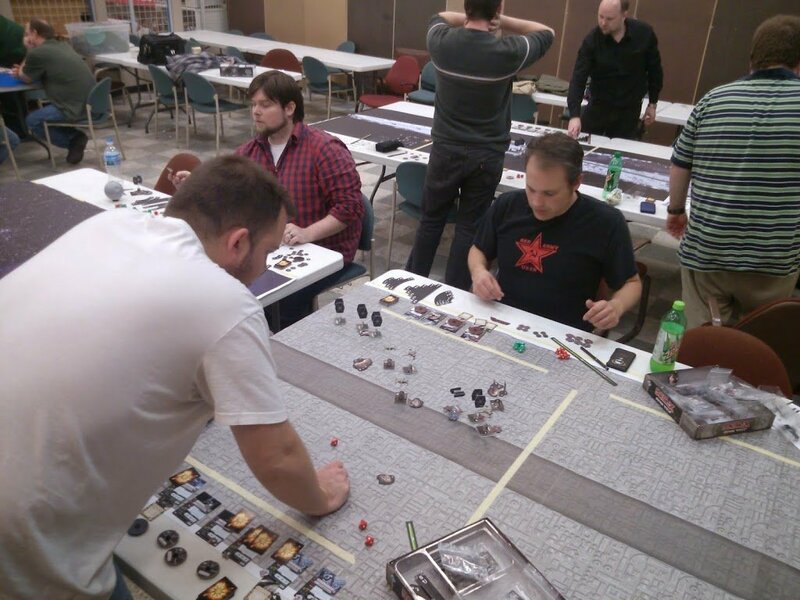 Again- you can play X-Wing just about anywhere you’ve got a 3′ x 3′ square. Lots of people, especially the more casual types aren’t going to come to a store to play when they’ve got everything they need to play 10′ away from them inside their own house- you’ve got to give them a reason to show up. This reason can be lots of different things, and it doesn’t have to be a static thing that never changes either. Most commonly the reason is a competitive setting, namely a tournament. Playing competitively is a nice change of pace for groups who swing casual, and if you’ve got a store that’ll support your group’s tournament a bit by letting you print up flyers, allowing you to use their space, or God forbid providing prize support, so much the better. If X-Wing sells at all in your store, you’ve probably got a pretty decent chance at talking them into helping your and your pals host some kind of shindig. You’ll never know if you don’t ask, so ask away. What’s the worst that can happen? You’re basically doing their PR work for them. If running a tournament isn’t your cup of tea, start getting creative instead. Come up with some custom scenarios, print them up, and distribute them on game night. Give everybody 10 minutes to create a list with the stuff they brought then play through your custom scenario and when the games wrap, have the players switch lists and play through again. Get some people together and start up a league. Model it after pro sports leagues and have everyone play each other once or twice per “season”, give points for wins, losses, and draws and crown a champion at the end. Organize an Epic match with multiple players on each side. Or better yet, start some kind of linked campaign that starts off with one-on-one matches between players, then culminates in an Epic match with advantages and disadvantages conveyed from the results of those one-on-ones they played previously. Or hey, maybe you can make a help make a difference and give your community a shot in the arm at the same time by doing some kind of charity event for a local Red Cross or food bank or something. I mean would you play in a tournament where the entry fee was a pint of blood or a bag full of canned goods? I would. I mean, that’s pretty cool. Remember too that folks are more likely to approach a group that looks like it’s, well a group. If it’s just you and your buddy it looks an awful lot like a pick up game and while some folks will still wander up and talk to you, it’s sometimes easier to walk into a room of people playing and just kind of browse around to see what’s up. If you’ve got 6 or 8 or 10 people playing, it looks more like a Community Hosted Event, and people like to be part of communities. Again- the idea here is to give people a reason to come play where you’re playing, so be inviting. Chat up the folks that walk up even if it means having to take 10 or 15 minutes away from your game to talk to them and answer their questions about the game and your group. Getting the word out about your group can potentially be just as difficult as coming up with compelling reasons for people to show up, but you do have one thing going for you- the internets. While it might be fun to buy a domain and set up a messageboard or something, if you don’t have some fairly competent folks who can do some SEO work to be sure your site gets noticed by the folks you want to notice it, it can be kind of a waste. Facebook, Twitter, Google Plus, Instagram, and all those social media services are probably a better bet for your group. Established messageboards like those in the BoLS lounge, the main FFG site, A Few Maneuvers, and so on are good places to put the word out too. At the least, try and get people’s names and email addresses so you can communicate with them by putting up a sign-up sheet at your store or on a communication board at your school, church, or work. Where your group meets is important to be sure, but as we’re all creatures of habit we need to more than just where we’re going to meet up- we gotta know when too. The “when” can be just as important if not more so than the “where.” Keep the “when” simple- and by simple I mean pick the same “when” and stick to it. Talk to your peeps before you broadcast out that you’re going to play on Thursdays starting at 6pm only to find out that two or three of your best, most outgoing, good sports can’t make it because they have a prior commitment but they could totally do Tuesday or Wednesday and now you’ve gotta go back and change things up. Pick your place and time and stick to them. If people know that every Tuesday night at 9pm you and your buddies play a few games in the commons area of your dorm, they’re more likely to show up than if you play every night for a couple of weeks, then stop playing at all for a month, then start up again only on Sundays. Once you establish the “when” and the “where”, be sure to show up. Your first few sessions may not amount to much, but if you want things to happen, you gotta stick with it and keep on showing up. Nobody likes to waste their time, but folks don’t always get the message right when you put it out there, y’know? Maybe your store retweeted your X-Wing group announcement a couple of weeks back, but a couple of prospective players couldn’t participate because they hadn’t moved in yet. But they wrote it down or put it in their phone or whatever and they show up a month later to an empty store, gear in hand. Bummer, right? Who knows- maybe one more week and you would have gotten three or four new members. Show up at the time and place you said you would stick around for awhile. If people turn up, great. If it’s been an hour since your scheduled start time and nobody shows, maybe pack it in. Good luck with organizing your groups, and hey- if you’ve got some great ideas you think would work, or even better, if you have some ideas that did work for your group, why not share the love and post them in the comments below? It’s like grass roots, y’all! 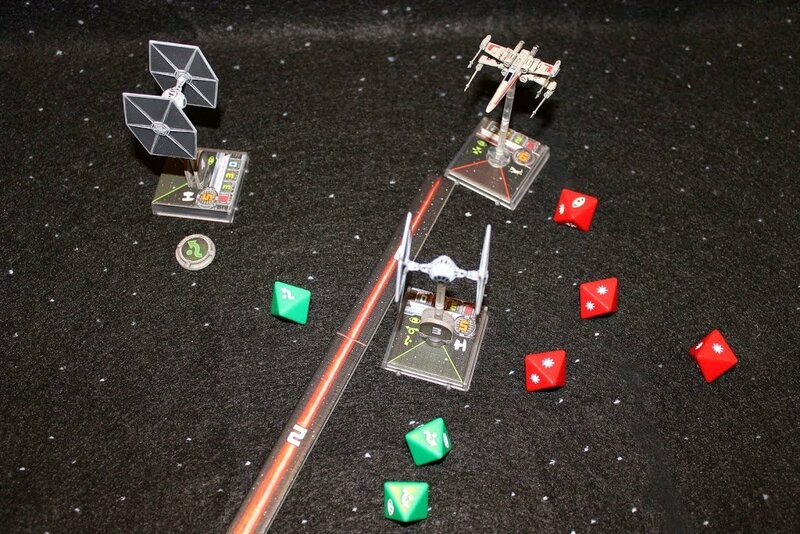 If you want to get into X-Wing Miniatures but don’t know your Evades from your Target Locks, by all means, stop on by the hippest pilot bar in the galaxy- TheMetalBikini.com. We serve all kinds (yeah, even droids- they’re the best tippers), and have a whole bunch of articles from breakdown summaries of every single card released so far, to tactics articles, to our Bikini Battle Basics new player guides- all served up with a heapin’ helpin’ of my own personal brand of slang and humor. Can you dig it?